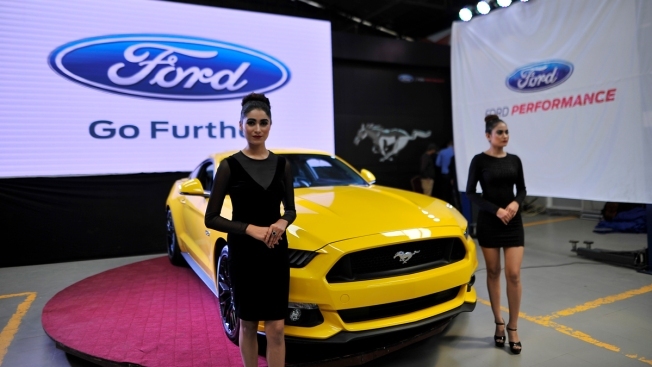 This March 30, 2018, file photo shows models pose in front of Ford's Mustang GT during launch program at Ford Showroom, Kathmandu, Nepal. The company recently released its first-quarter earnings report and indicated the Mustang would be one of only two car models it produces in North America by 2020. Facing declining demand for passenger cars, Ford is starting to phase out their production in North America, CNBC reported. Ford will only produce two kinds of cars in North America by 2020: the Mustang and a new Focus Active crossover, the automaker announced in its first-quarter earnings report Wednesday. The rest of its American portfolio will consist of SUVs and trucks, the company said. Ford is realigning what it produces to fit changing consumer tastes. The company's earnings in the quarter beat analysts' expectations, and Ford is accelerating cost cuts — slashing $25.5 billion in cost and $5 billion in capital spending. "We are going to be fit across our entire business," CEO Jim Hackett said on a conference call.